The Department of Parks and Recreation, Friends of the High Line and the Hudson River Park Trust acquire their ipê from the Amazon. According to the government of Brazil and numerous environmental groups, 80% of logging in the Brazilian Amazon is done illegally. Criminal syndicates, which own many of the logging operations, bribe officials, use forced labor and, on the frontiers, literally out-gun Brazil’s environmental regulatory agency. The ipê of our City’s infrastructure has been linked not just to global warming but widespread human misery. Many people are familiar with the concept of blood diamonds—diamonds produced by violent cartels and forced labor. But what they might not know is that blood timber exists as well. And if you’re importing wood from the Amazon, that’s most likely what you’re getting. 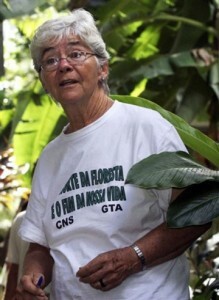 The story of Sister Dorothy Stang, a woman born and raised in Ohio, illustrates just one facet of the human tragedy of Amazonian deforestation. Sister Dorothy became a nun, the kind who practiced liberation theology, who believed that God could be found right here, on the land and among struggling people. During the last two decades of her life, Sister Dorothy served in the Brazilian Amazon, where she worked ceaselessly to protect the rainforest and peasants from violent loggers and ranchers and speculators, all vying for resources. Sister Dorothy saw human rights and environmental conservation as intertwined, and she worked to transform poor settlers into cohesive, environmentally conscious communities. Her last mission ended on the morning of February 12, 2005, when two gunmen confronted the petite 73-year-old nun on a secluded jungle path. A conversation ensued, overheard by a witness who later testified at the men’s trial. Sister Dorothy admonished the gunmen—the land was not theirs, they had no right to plant pasture grasses for livestock. “So, you don’t like to eat meat?” one of the assailants taunted. “Not enough to destroy the forest for it,” she replied. “If this problem isn’t resolved today, it’s never going to be,” the man said. As the man reached for his gun, Sister Dorothy opened her Bible to Matthew and read from Chapter 5: “Blessed are they who hunger and thirst for justice, for they shall be satisfied.” As she turned to go, the man leveled his revolver and squeezed the trigger. 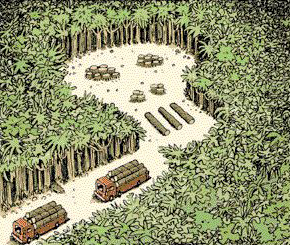 In Brazil, the events set in motion by logging are almost always more destructive than the logging itself. Once the loggers and first wave of mercenaries have moved on, their roads serve as conduits for an explosive mix of squatters, speculators, ranchers, farmers, and additional gunmen like the ones who assassinated Sister Dorothy. Quite simply, without the massive demand for ipê and other tropical hardwoods, the cartels wouldn’t be able to operate. Tropical wood is the only resource profitable enough to fund the expensive, difficult work of punching openings into old-growth forests. We want to make clear the culpability of NYC officials: while scientists say that tropical deforestation begins with a logging road, we know it begins here, in bid orders, when agency heads demand rainforest wood instead of alternatives. Still, there is some good news to report. 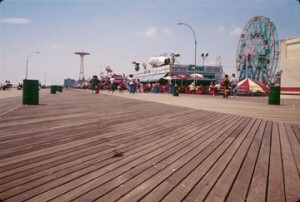 After a decade of Rainforest Relief campaigning, in December 2007, Celia Peterson, director of the Parks Specification Office, stated that the agency stopped using tropical hardwoods for city benches, thus sparing 50,000 board feet of rainforest wood each year.